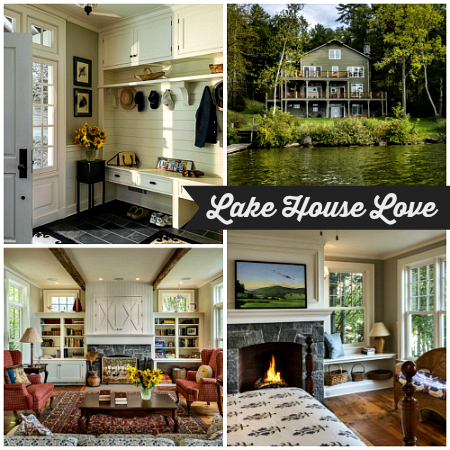 I made a “dream collage” years ago with photos of pretty lake houses I’d like to live in. Two of the houses I’ve owned since then have had drainage issues in the backyard, so maybe I should’ve been a little more specific when I said I wanted a house on the water (ha). This lovely 1920s lake house is for sale in Connecticut and would go on my collage if I were creating one today! It was built as a farmhouse in 1921 but has been updated since then. This artfully updated and expanded Riverside beauty incorporates all the essentials for a busy household. Enjoy an idyllic lakeside setting on a quiet crescent with approximately two acres of grass surrounding the water, and sunset views from the front porch. It has 5 bedrooms, 3.5 baths, and 3,500 square feet. It looks so friendly with the kitchen nook and big bay window, doesn’t it? Stunning home and great location. So many times lake homes are little shacks OR nice homes intermixed with little shacks. This location looks GORGEOUS. Very pretty! I don’t decorate with green, but I’d be perfectly happy with that exquisite green kitchen! Laura makes a good point about swimming. I love to swim, so it would be heartbreaking to me, living on the water and not being able to. This home is gorgeous. The décor is a nice blend of country and traditional. I imagine lots of fun family gatherings have happened in this lovely yard. I know this house well. It is indeed beautiful but the lake is very small and shallow and is only good for ice skating when it is cold enough for that. Nice house and property. I am glad to see they didn’t mutilate it in the name of updating. I liked every thing they did but the sofa in the living room doesn’t look at all comfortable. Wow! This is gorgeous! I love everything but especially the kitchen with the nook! It manages to be spacious and cozy. I absolutely love all the windows in that house!! I always live in a small amount of scroll-down fear with these remodeled older homes. They usually are all beautiful, but I want so badly for them to retain the charm of an older kitchen – and so often I am disappointed. But not this time! It has modern touches but still feels appropriate for the house. LOVE!! I absolutely love the house! Love it! The kitchen is a dream but I would not have put in a black sink.